Southern California's premier brick convention January 11th & 12th, 2020 at the Pasadena Convention Center! VIB registration will be open soon! Adult Fans Of LEGO® – join us for three days of building, games, and fun in Pasadena, CA January 10th-12th, 2020! AFOL means Adult Fan Of LEGO® and we affectionately refer to AFOLs who attend Bricks LA as VIBs – Very Important Builders. 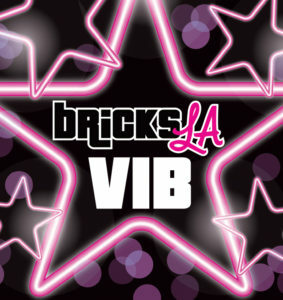 VIBs create the brick built models that are displayed all weekend at Bricks LA. They are also able to participate in games and activities throughout the weekend designed to test their skills and and have fun with other adult LEGO® fans. Access to all Bricks LA events throughout the weekend (games, activities, giveaways, etc.)! Saturday night after hours party! Bricks LA brick badge including two custom printed bricks! Bricks LA swag bag full of fantastic goodies! Ability to register MOCs to participate in the public exhibition and theme contests! Join our mailing list for the latest Bricks LA news!